Delhi is no fairytale city but a city where dreams come to reality. Its strategic location was one of the prime reasons why successive dynasties chose it as their seat of power. Delhi is truly a symbol of the old and the new, a blend of ancient well preserved monuments and temples along with jam-packed burger joints and upmarket shopping malls. Red Fort : Red Fort is one of the most magnificent palaces in the world. India's history is also closely linked with this fort. It was frorth here ht the British deposed the last Mughal ruler, Bhadur Shah Zafar, marking the end of the three century long Mughal rule. It was also fromits ramparts that the first prime. Minister of India, pandit Jawharlal Nehru, announced to the nation that India was free form colonial rule. The Diwani-I-Am is the Red Fort's hall of public audience. Built of sandstone covered with shell plaster polished to look like ivory, the 80 x 40 feet hall is sub-divided by columns. The Mughal emperors would hold court here and meet dignitaries and foreign emissaries. The most imposing feature of the Diwqani-I-Am is the alcove in the back wall where the emperor sat in state on a richly carved and inlaid marble platform. In the recess behind the platform are fine examples of Italian pietra-dura work. India Gate : Built as a memorial to commemorate the 70,000 India soldiers killed in World War I, India Gate was designed by Sir Edwin Lutyens and completed in 1931. Located on Rajpath, the road which leads to the magnificent Rashtrapati Bhawan, the gate is 160 feet high with an arch of 138 feet. Built from sandstone, the arch also houses the Eternal Flame, a gesture in memory of the Indian soldiers who laid their lives in the 1971 war with Pakistan. Qutub Minar : Soaring high above the Quwwatual Islam mosque is the tower Sultan Qutbuddin Aibak built in AD 1196 to celebrate the invincibility of Islam. Although modelled as a classical minaror tower from which the muezzin calls the faithful to prayers, the Qutb Minar was a symbolic rather than a functional structure. It would be an extraordinary muezzin who would expect to be heard from a height of 72.5 meters - assuming, in the first place, that he managed to trudge up the 379 steps five times, each day. Qutab Minar points up to heaven on the southern side of the city. Akshardham Mandir : Swaminarayan Akshardham in New Delhi epitomises 10,000 years of Indian culture in all its breathtaking grandeur, beauty, wisdom and bliss. It brilliantly showcases the essence of Indias ancient architecture, traditions and timeless spiritual messages. 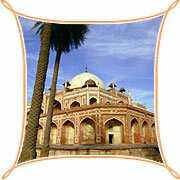 Humayun's Tomb : Humayun's Tomb was built nine years after Humayun's death by his wife Haji Begum. Designed by a Persian architect named Mirak Mirza Ghiyas, and completed in 1565, the edifice was a trendsetter of the time. It is said that all later Mughal monuments, including the Taj Mahal, followed its design. Lotus Temple : The Lotus Temple, situated in South Delhi, is shaped like a lotus. It is an eye-catching edifice worth exploring. Built by the Baha'i community, it offers the visitor a serenity that pervades the temple and its artistic design. 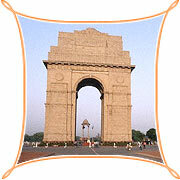 Delhi is one of the major tourist destination, where international tourist inflow is also quite good. So the options of luxurious accommodations are plenty. If you are a budget travellers, there are numerous tourist lodges as well mid-range hotels in Delhi. Delhi is unique in that it has representative outlets for the handicrafts of each Indian state. This in it self presents a staggering array of goods, and at very affordable prices. In the last decade there has been a dramatic change in Delhi's markets. Upwardly mobile lifestyle has led to greater sophistication in display and upgrading of various markets in terms of availability of items. Rail : Delhi is very well connected by rail to all parts of India. Delhi currently has five railway stations. The main office for making train reservations is located between the New Delhi Station and Connaught Place on Chelmsford Road. Road : Delhi is Linked with Bus Services of Delhi Transport Corporation (DTC) and state roadways of the neighbouring states to all important cities and destinations in North India. The Inter-State Bus Terminal (ISBT) located at Kashmiri Gate is fully equipped with a bank counter, tourist information center, post office and snack bars.